September will be a nice start for the 2013-2014 basketball season, with plenty of opportunity for community involvement! Home games will start the month and a handcylce ride across two states shall end the month! Fans are welcome to be part of both! The first games of the year are just days away! The Carolina TarWheels host Winston Salem's Triad Trackers in a double header at J.N. Fries Middle School on Saturday September 7th! These are important first games as they are also divisional conference games! 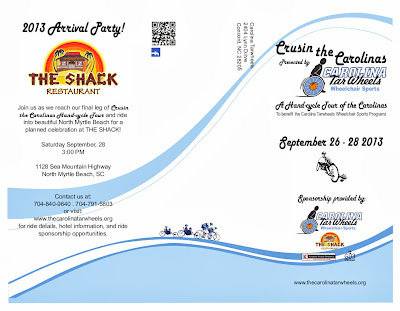 Check out the next tab above for maps and links, or you can also RSVP on the Facebook event page! ...hope to see lots of fans in the stands! The TarWheels Wheelchair Sports Organization raises money in a couple fundraisers each year. The handcylce ride is up next for the group and only a few weeks away! Last year was a great time as members of the organization as well as friends and family of the TarWheels rode on handcycles and bikes from Norwood, NC to N. Myrtle Beach, SC! 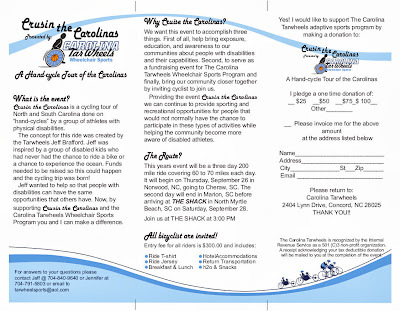 Crusin The Carolinas Handcylce Ride will be held September 26th-28th this year! Each of the TarWheels participating are looking for sponsors! Make sure to let them know if you are able to make a pledge in support of their efforts to raise funds for the wheelchair sports organization! We are also encouraging the participation of any bike rider in this years event! A copy of our brochure is available below with more info on how to become a participant and how your donation helps in support of such an organization! 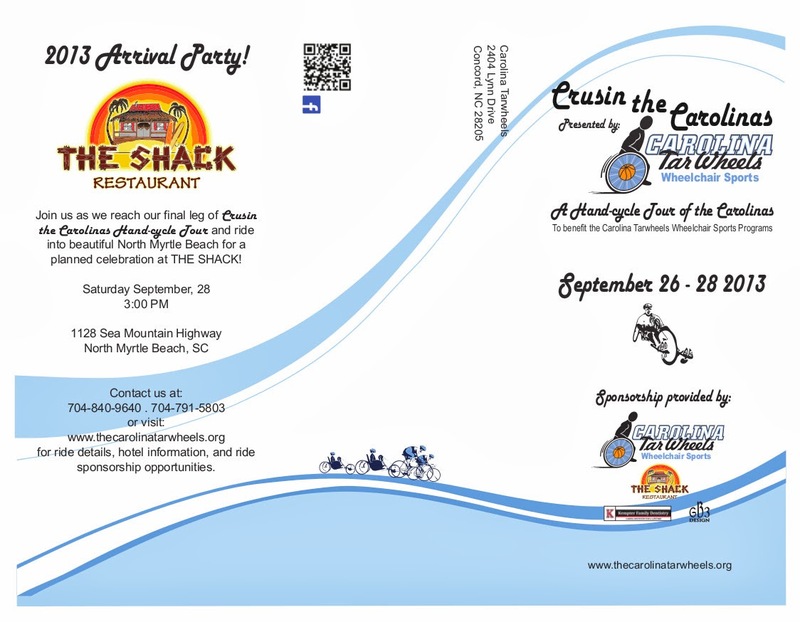 Come be part of the celebration when participants pedal right up to The Shack Restaurant on Saturday the 28th! -thanks from all of The TarWheels!